It’s easy to be skeptical of a site like Swagbucks. We’ve all seen our share of companies and services that make big promises and then only deliver limited results (or no results at all) — especially in the “make money online” space. But then again, I was reading about Swagbucks on legit, well-known personal finance sites. So, I figured why not give it a shot. After over a year of using the site, it turns out Swagbucks is no scam. It’s a legit site where you can earn extra money. Sign up for Swagbucks for free. Earn points, which are called SBs. There are multiple ways to earn points. The most notable are shopping online, watching videos, using their search engine, and completing surveys. Exchange points for gift cards or cash. Let’s look at an example of one way to earn. Say you spend $100 on Amazon. If you used the Swagbucks shopping portal, you would receive up to 3 SBs for every $1 you spend. Therefore, after a $100 purchase, you’d have 300 SBs. 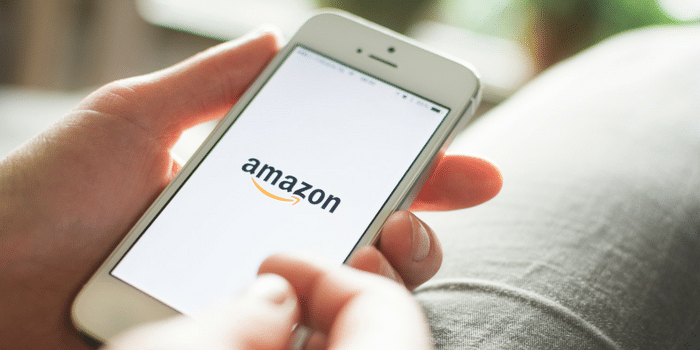 A $5 Amazon gift card costs 450 SBs. 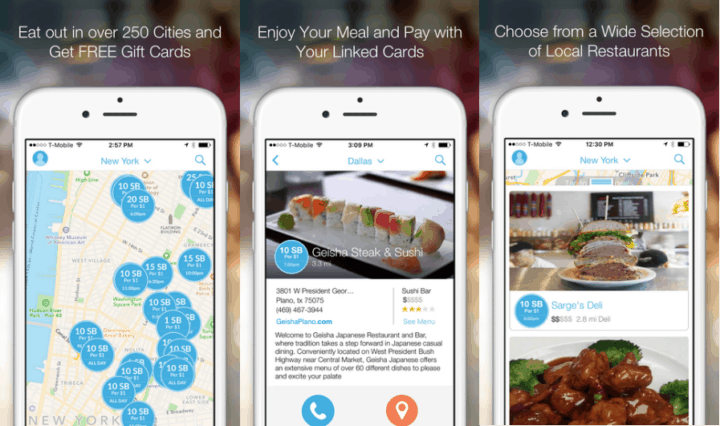 (You also get a 12 percent discount on your first $25 monthly gift card redemption). Points can also be redeemed for cash at a rate of one penny per point, which is deposited into your PayPal account. Swagbucks.com is a U.S.-based company that was founded in 2005. 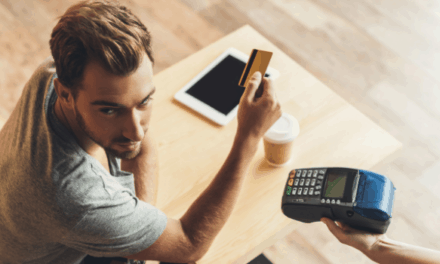 It’s owned by Prodege, which also operates the popular site MyPoints. In terms of cash back reward sites, Swagbucks is quite popular. Swagbucks itself has paid out over $300 million in rewards. It’s also worth mentioning that Swagbucks is 100 percent free to join. You only need to provide your name and email address. While Swagbucks doesn’t offer a complete list of countries, the following countries are confirmed to be available. If you don’t see your country on the list above, make sure to sign up. There’s still a chance your country is currently available. If not, you’ll be notified when Swagbucks is available where you live. SBs are typically worth one penny per point. If you accumulate 1,000 Swagbucks, you can exchange them for $10 in gift cards or cash. There are also frequent sales that allow you to get more value for your SBs. Currently, Swagbucks is offering a $25 Visa gift card at a 13 percent discount. Cashing out with this sale would put the value of one SB at 1.15 cents per point. The best sales are from specific retailers. As of right now, Swagbucks allows you to trade SBs for Domino’s gift cards with a 20 percent bonus. If you were going to spend money at a specific retailer anyway, buying discounted gift cards maximizes the value of your Swagbucks points. In order to earn a $50 Amazon gift card, you have to earn 5,000 SBs. That’s about 166 points per day on average over a 30-day period. 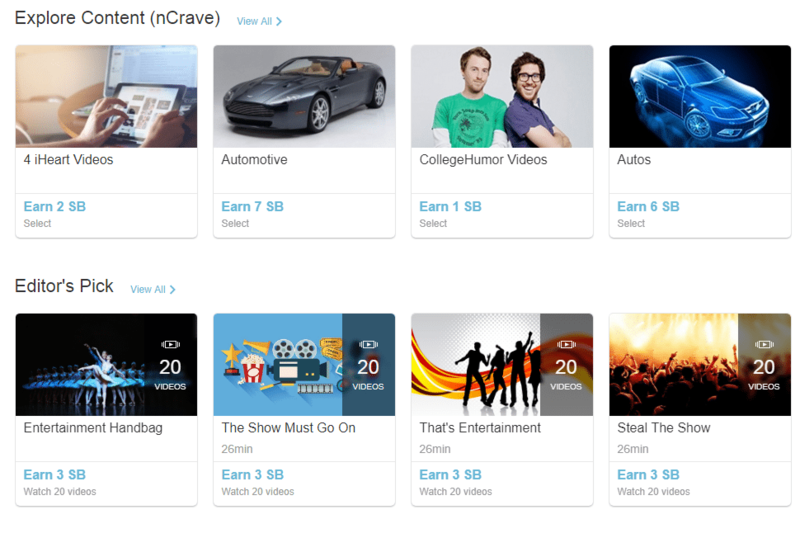 One of the biggest reasons I recommend Swagbucks is the variety of ways to earn. For example, I don’t take their surveys but I benefit substantially from their cash back portal. That’s because it only takes a few extra seconds to earn as much as 3 percent cash back on most of the items I buy on Amazon. 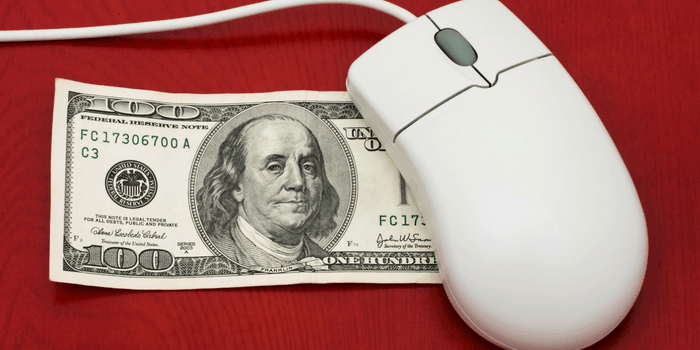 If you shop online, this is by far the quickest way to earn points. One tip is to look out for specific promotions, where the amount of cash back you can receive is higher than usual. For example, at the time of writing, Swagbucks is offering up to 10 percent cash back on travel websites. This can add up quickly and easily; a $500 hotel stay can earn you $50 worth of SB points. Hotels.com Pro Tip: One of the top credit cards for travel, The Capital One Venture Rewards Cards, offers 10 percent cash back on hotels.com. By combining a credit card cash back offer with Swagbucks, you can get up to 18 percent back on your hotel.com purchases. On the other hand, surveys and watching videos take a little bit more time. But for those in need of a quick buck, they can be an excellent way to make money. Once you’re signed in, navigate to the “Watch Videos” page. Here’s the thing. The movie just has to be playing. You don’t have to have your eyes glued to it. You can be on Facebook, reading a news article, or watching TV while the movie is playing in the background. You can earn up to 500 points per day by watching videos. 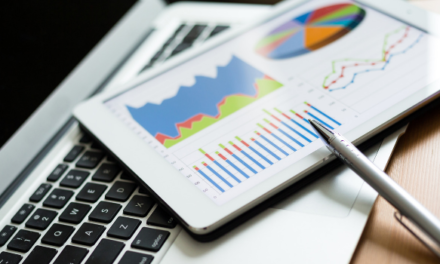 While videos are an excellent way to earn for those in front of a computer for much of the day, a quicker way to earn is by taking surveys. When I open up my browser, I see the following opportunities. Scanning through the different surveys, I would then go ahead and take the survey that’s worth 500 SB points (which takes an estimated 27 minutes to complete). Since I only need to average 166 points per day, that one survey takes care of three days worth of earning. Below is a list of other ways to earn money on Swagbucks. If you’re an internet gamer, this one’s for you. You can earn SBs just for playing games on Swagbucks. You can earn up to 500 Swagbucks per day just by watching videos. There are many different categories, such as entertainment, home, travel, and games. Surveys are one of the most popular ways to earn Swagbucks. You’ll be glad to hear that when we ranked the best survey sites according to user reviews, Swagbucks came in at #1. Some of these online surveys pay up to 500 SBs each. You have to qualify for each survey before you take it, but Swagbucks tries to match you so that you don’t waste time answering qualifying questions. Each paid survey takes roughly 20 minutes to complete. There are some that are longer and some that are shorter. And although you won’t get rich, you can easily earn an extra $20-$30 each month taking paid surveys. There is also the Swagbucks daily poll, which is a short one-question daily survey you can take for 1 SB. 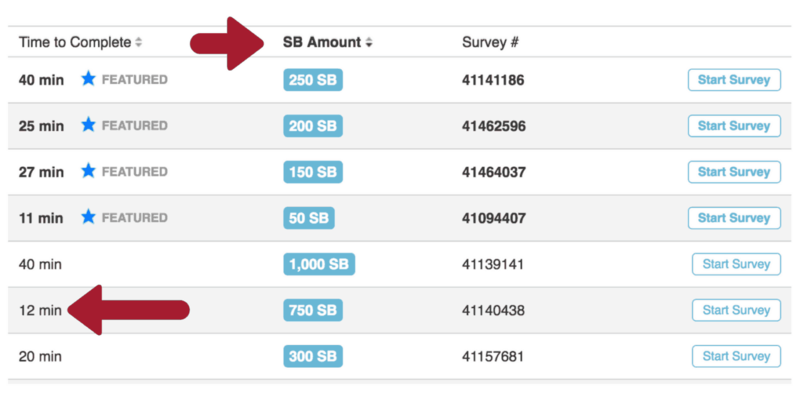 Pro Tip: Make sure you sort the surveys by potential earnings by clicking “SB Amount.” The featured surveys will pop up first, but underneath those you’ll find surveys from highest to lowest payout. Look for high earning surveys that take the least amount of time. Swagbucks also offers coupons and deals to help you save money at a variety of stores, while also rewarding you with SBs when you use their coupons. Using the online shopping portal is the fastest way to earn points. One creative way to earn money is with Swagbucks Coupons. Swagbucks Coupons are for in-store use. You’ll earn 25 SBs for every coupon you use. So, not only do you get a discount on what you’re buying, but you’ll also earn Swagbucks points for redeeming the coupon. The SwagButton is a must-have chrome extension for Chrome, Firefox, or Internet Explorer. Keeping the extension installed allows you to earn you 1 SB per day, but it also helps you earn you extra Swagbucks in a couple of different ways. The tool enables you to earn SBs by shopping online and playing videos (in the corner of your screen), and lets you redeem Swag Codes right from your browser. Swagbucks Discover is my second favorite way to earn SBs. This is where you’ll find special offers from certain retailers. Money Makers allow you to earn money when you buy something. 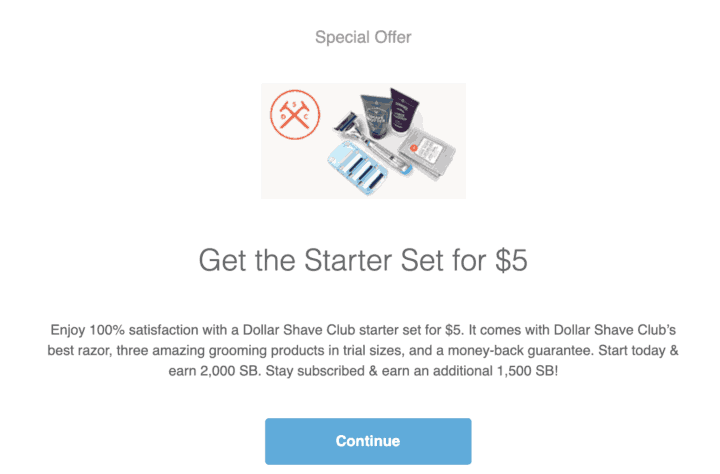 One Money Maker I recently took part in was with Dollar Shave Club. I got 2,000 SBs (valued at $20) for spending just $5 on merchandise. Another popular Swagbucks Discover deal is with Hulu. Here, you spend $7.99 on Hulu and get a $10 gift card in return. One way to earn passive income with Swagbucks is by using Swagbucks Search. The Swagbucks search engine, which uses Yahoo search results, allows you to earn SBs every time you search the internet. It will also alert you to opportunities to earn SBs at specific websites you use. Make sure to download the Swagbucks mobile app. The app is available for both Android and iOS. With the Swagbucks app, you can take advantage of the many ways already discussed to earn points (like surveys, watching videos, and playing games) on the go. In addition, there’s Swagbucks Local. With Swagbucks Local, you link your credit card and then automatically earn points at participating local retailers. Since there’s nothing else you need to do once you link your card, this is as close to free money as you’ll get. Looking to share Swagbucks with your friends? 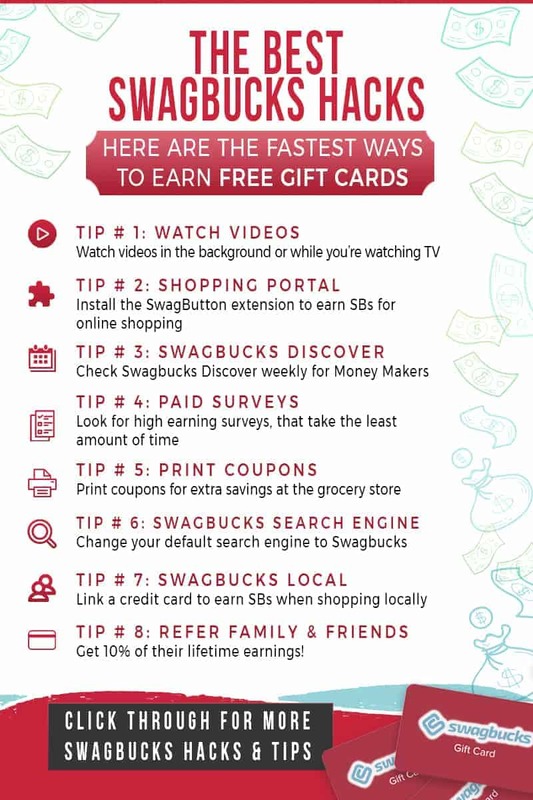 Swagbucks referrals are a great way to make a lot of Swagbucks at once, and maximize your earnings. Whether you share your referral link on Facebook, email your friends, or put a banner on your blog, once a friend signs up through your link, you earn! For every person that you refer, you receive 10 percent of the Swagbucks they earn — for life. Cashing out your Swagbucks rewards is easy. But, if you need money today, know that it does take a little bit of time to get your rewards. You can redeem your SBs for gift cards from retailers like Amazon, Lowes, Target, Starbucks, Walmart, iTunes, and more. There’s also an option to cash out with PayPal and receive actual cash. 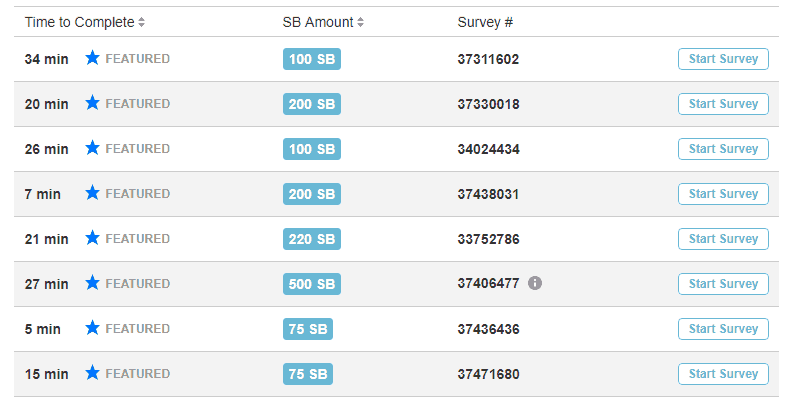 The Swagbucks redemption rate is the same across the board, which means you get roughly $1 for every 100 SBs you earn. There are, however, times when certain gift cards will go on sale and you can get more cash value using fewer SBs. You can redeem your Swagbucks rewards twice a day, and it can sometimes take up to 10 days before you receive your reward. When it’s ready, you’ll get an email from the site notifying you that your gift card has been processed. Then you just click on the link in that email, log into your account, and your reward will be waiting for you there. It’s as simple as that. One cash-out strategy many readers of TW2W use is to build up SBs throughout the year and then redeem them all for gift cards during the Christmas season. By doing so, you can avoid the big jump in expenses that often accompanies the holidays. 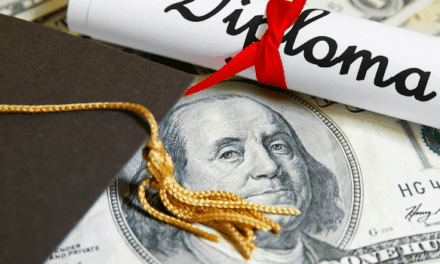 From college students looking to earn money to those who want to make extra money with their online hobbies, making money through Swagbucks is straightforward. There are no tricks or gimmicks. It’s a legit site to earn gift cards or cash.